Hunting is as fundamental to Vermont's cultural heritage as dairy farming, and its lineage reaches back beyond the arrival of the first European settlers. But as Vermont has changed, knowledge of hunting is no longer universal and many Vermonters know very little about the culture or tradition of hunting. Based on interviews with hunters conducted by the Vermont Folklife Center, the Deer Stories series explores hunting from an insider's point of view. Programs explore such topics as tracking, gun accidents, hunting culture and the taking of an animal's life. The twenty-three narrators featured in this series were chosen for their passion, knowledge, commitment and excellence as deer hunters, and their stories are representative of stories heard many times over in the course of this research. 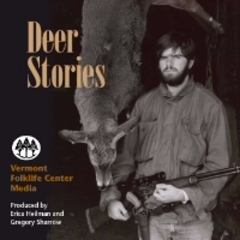 Deer Stories features the voices of Vermonters Doug Bent, Rupert LaRock, Joe LaRock, Phil Brown, Frank Kurant, Stan Redlon, Ron Boucher, Mark Scott, James Ehlers, Ray Keyser, Reg Kribstock, Mary VanVeghten, Prentiss Dwinell, Stan Holmquist, Gayle Streeter, Hannah Streeter, Doug Lawrence, Joanne Ward, Shane Benoit, Barry Forbes, Nellie Staves, Cleo Johnson, and Roy Hines. Some hunters will only hunt alone. Others choose their companions carefully. In this program, you'll find out why.